Keep your closet organized and your clothes wrinkle-free with these best hangers. Wood hangers are a great choice for heavier items prone to wrinkling, like suits and sportcoats. They add a sense of organization and upscale look to any closet and withstand more weight than typical metal or plastic hangers. While you can find wood hangers in a variety of finishes, our pick is The Container Store’s Basic Walnut offering. These simple shirt hangers come in a pack of 36 and measure 17-7/8" x 1/2" x 9-1/4". They’re designed with a flat profile so that they don’t jut out in your closet, reducing wasted space and helping you keep a clutter-free closet. Each one has a chrome swivel neck that is treated against rust and aging. One pack of these and your closet will be instantly transformed. If you’re looking for a great wooden hanger at a great price, The Container Store’s Basic Walnut Hangers are the best choice. Velvet hangers look classy, and are a great choice for delicate items like dresses and camisoles that are prone to slippage in your closet. They are also space saving — taking up less of a profile then wood and plastic hangers. The IEOKE velvet hanger is 17.5” x 9” x 0.24” and can hold 10 pounds of weight, despite its lightweight frame. The pack of 30 comes in a deep gray that looks stylish in any closet, and even on freestanding garment racks. The company also provides a 180-day worry-free guarantee — so if they don’t suit your needs, you can get a full refund. Owners say they do a great job at keeping clothes from falling, even when it comes to heavy wool coats. If you have a variety of clothing to hang in your closet, match these with a simple white wood or wire hanger for a seamless look. Wire hangers are a closet mainstay, but a good wire hanger doesn’t bend or give while in use. The Jetdio galvanized metal wire hangers are our pick for the best wire hangers for any type of closet. Versatile and subtle, they have a small profile so they don’t take up much room, but the 1/8th-inch metal is heavy enough to hold standard shirts or dresses. Each hanger is 17" wide, and the set comes with 30 pieces so that you can replace all of your hangers at once. While these hangers aren’t heavy duty (don’t expect them to hold your winter jacket), they’re perfect for everyday use. Owners love the slim and ergonomic design, stating that they hold medium-weight items evenly without slippage. They are also formulated to resist rust, so you don’t have to worry about replacing these after a few years. While wood hangers are a great versatile choice for a heavy-duty hanger, sometimes you need even more strength to hold your belongings. The Cresnel U-Slide Hanger is the perfect choice for those looking for a powerful hanger with a low profile. They’re great for hanging an entire outfit to make mornings easier — each one can hold up to 12 pounds of clothing, which is strong enough for an entire suit. Made from heavy-duty plastic with a silicone non-slip grip, the Cresnel hangers come in a pack of 50 and are slim enough to use for both everyday and heavy usage. The “u-slide” design is crafted to help you keep shirts and blouses on the hanger without stretching out their collars. Each hanger is 16” wide and has a swivel hook. 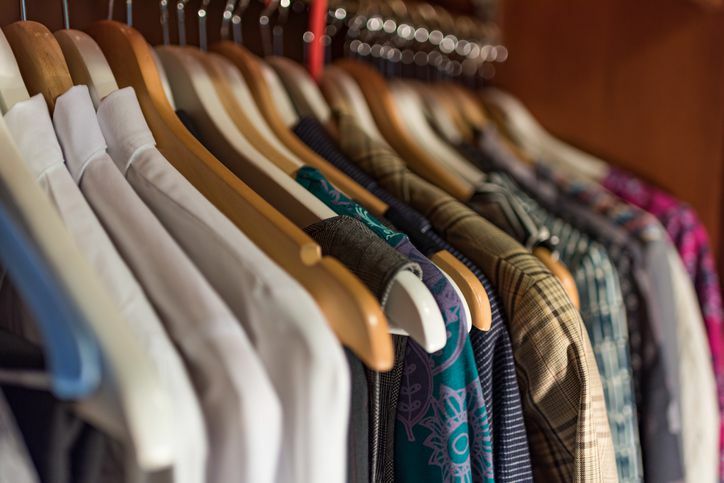 Many owners recommend them for tight closets, saying that by adding multiple pieces of clothing you can make outfit choices easier and save space in a crowded closet. We also love these heavy-duty hangers for an entryway closet because they’re perfect for those heavy wool coats. Plastic hangers are an affordable way to hang your clothes. This version comes with 60 in the set, so that should be plenty for all of your hanging needs. 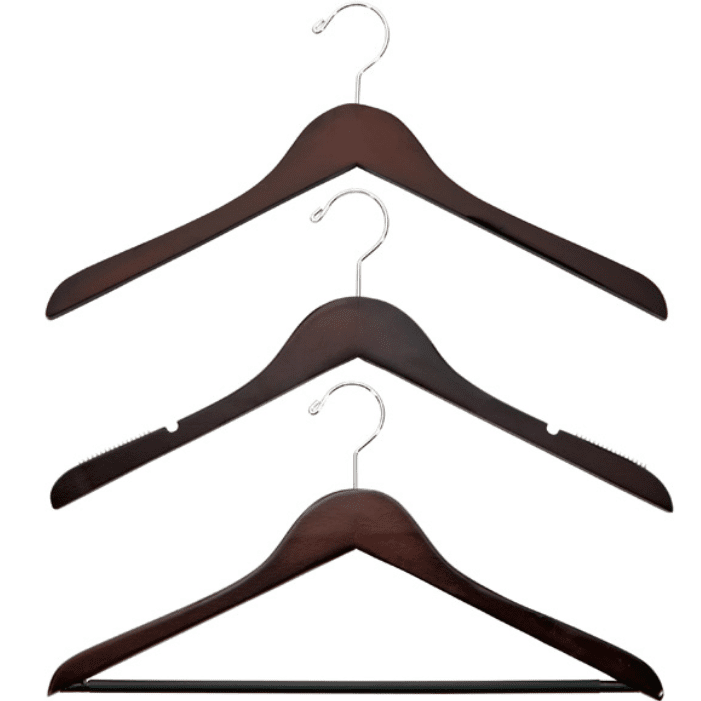 Each hanger measures 16" x 10" x 1/4" making them the ideal size for every closet. Each one has a double hook on both sides so you can hang skirts and anything that has loops to hang. They're also made with double plastic so they will hold up with heavy weighted items. Made in the USA, this set is an affordable hanger option that can hold most clothing you would need hung. Keeping your slacks and skirts wrinkle-free can be a challenge. Whether you’re hoping to balance them on a standard hanger or trying to avoid indents from clips, it can feel like an endless cycle of ironing. That’s why we love The Container Store Lotus Wooden Trouser Clamp Hanger, which has the added bonus of taking up very little space. Each hanger is 11" x 1" x 6-1/2" and is perfect for lightweight trousers or skirts — with a full hanger clamp that won’t leave marks, unlike traditional metal clasps. Made from solid wood and chrome, the Lotus hangers are perfect for both small and large closets. Pair the Lotus pant hanger with the basic wood hangers from The Container Store for a perfect match for all of your clothes. Traveling doesn’t have to mean sacrificing crisp, wrinkle-free clothing. A collapsible hanger is a perfect choice for travelers and we love the Ipow hanger. Not only does this foldable 16” hanger allow you to hang clothing on a vacation or during a road trip, it also doubles as a baby hanger when folded, becoming just over 8” wide. Fold the hanger twice, and it becomes just under 6”, allowing you to easily store it inside of luggage. Each set comes with six pieces and is made of heavy black plastic. Owners love the Ipow hangers for cruises, business trips and moving, stating that they’re the perfect choice for anyone on the go. While we don’t recommend a collapsible hanger for everyday use, the Ipow hanger is the best choice for hanging clothes while you’re away from home. If you need to make a little more space in a closet or a bedroom, a wall hanger is a compact way to add more hanging real estate to a small space. The Newdora Wall-Mounted Hanger is made from premium grade stainless steel and mounts to any wall to add extra storage space. It has a 180-degree swivel so that you can fold it away when it’s not in use. When fully extended, the arm is 10” long and has five hooks for extra hanger space. The hanger can hold 25 pounds or more when anchored to the wall and comes with everything you need to install it. Owners love the Newdora in laundry rooms for drying clothes and on inner closet doors to add extra hanging space for ties, scarves and more. If your closet simply isn’t providing enough storage space, a wall hanger is a great choice to add more without doing any difficult installation. For more product recommendations to help you add valuable storage space to your closet, check out our round-up of the best closet organizers. When your closet is filled with a lot of skirts — a skirt hanger might be a wise choice to prevent them from falling on the ground. This skirt and trouser hanger has clips to keep your skirts from falling or getting a crease when hung over a bar. This set provides you with two hangers that each hold four skirts, so you can hang eight skirts in total with a slim profile saving you valuable closet space. Reviewer's love how this item keeps them organized and frees up closet space in cramped quarters. Since you only get two in the set it isn't a big commitment in closet or wallet space!